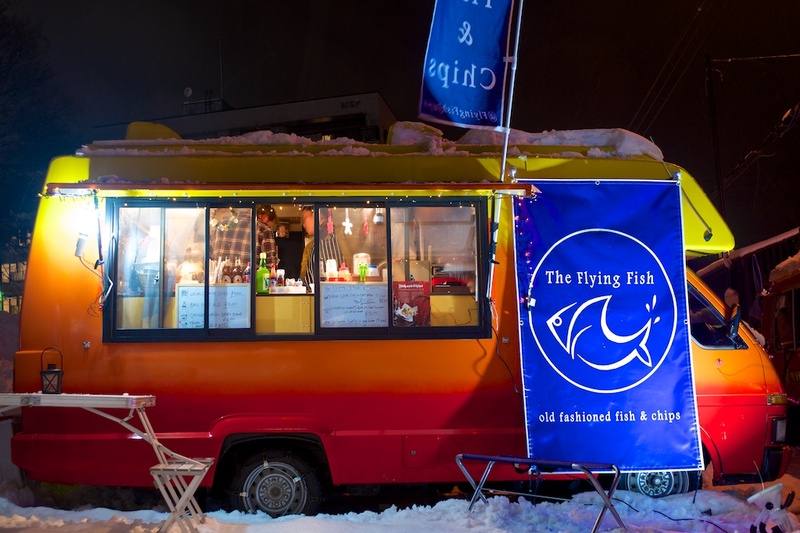 New for the 2013/2014 season, The Flying Fish fills a void that has been longing to be filled – authentic, British-style fish and chips. It’s a simple food, but it takes skill that only an Englishman can master. They’ve stuck to the basics here – fresh cod and real batter made from real English Bass Pale Ale, which is also for sale from their food van that is parked next to Seicomart. Want to know how fresh the fish is? Well, Matt and Yooja have eschewed all frozen foods in their quest for freshness, even though this decision requires a daily delivery from Yoichi to get it fresh from the fisherman. Of course, this quest for the freshest has its drawbacks – once they have cooked and sold today’s catch, they shut up so get in quick! It also means that if the fishermen don’t catch any fish, they have nothing to sell – but fortunately the fishermen are good at their job, and the cod are plentiful in the fresh waters off the Hokkaido coast. It’s not just the fish that is fresh, the potatoes are sourced locally from Kutchan. In case you weren’t aware, Kutchan is famous for their potatoes, which is why the mascot is a little skiing potato boy, Jagata-kun! 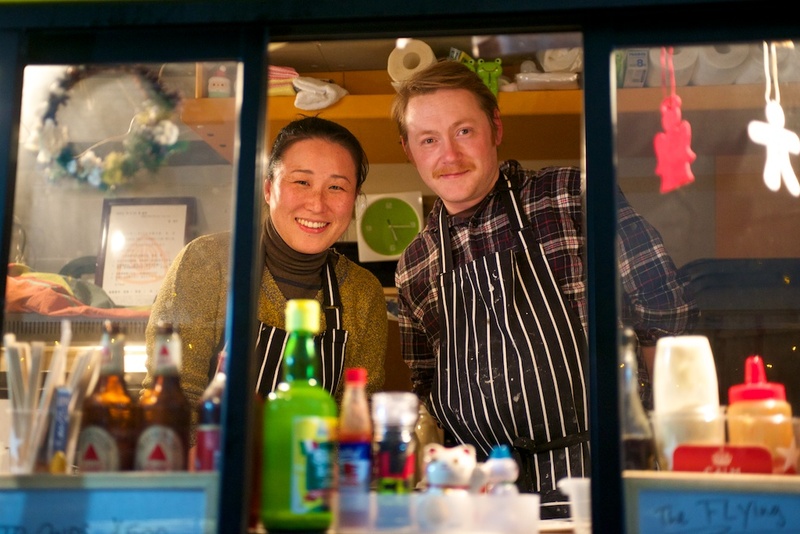 There is also beer battered squid, sourced from Hokkaido’s most famous squid port, Hakodate. Hakodate is so famous for squid that they actually have a festival every year that involves thousands of people dancing like a squid down the main street of town. I’ve left the most important question to last – is it any good? All I can say is, Oh my Cod! I’ve had the Fish & Chips several times already this season and it’s delicious. The cod is cooked to perfection and the chips do justice to Kutchan potatoes. Well done Matt and Yooja. Looks Good, but is the Taj Mahal Indian food van still operating next to the bus stop near Seicomart? Yep – both The Flying Fish and the Taj Mahal food vans are parked just behind the bus stop – across the road from Tamashii Bar. Awesome, thanks for the info !! 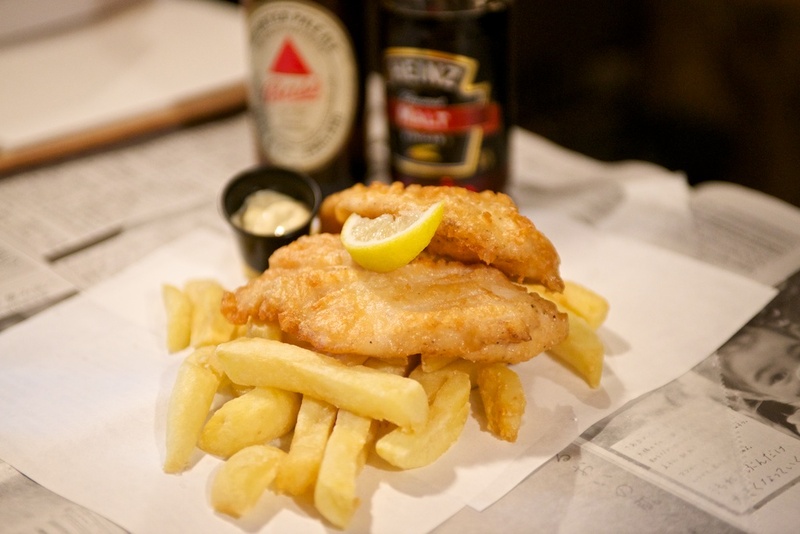 The Flying Fish is delicious, just like English Fish’n’Chips – great job guys!